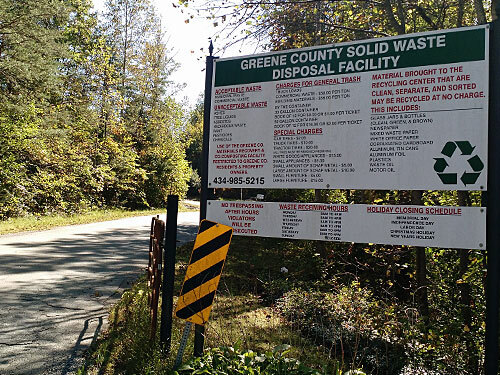 Greene County Solid Waste is a Full Service Recycling Center. Allen Morris is the Solid Waste Manager for the Greene County Solid Waste Facility. PLASTIC - #1 Plastic, #2 Plastic, milk jugs, soda bottles, etc. We accept only cash and checks. We do not accept debit or credit cards. Do you accept hazardous materials? No, the Greene County Solid Waste Facility does not accept any hazardous materials. Do you accept motor oil and antifreeze? Yes, we accept motor oil (must not have water in it) and antifreeze for recycling. Do you recycle florescent light bulbs? No, we don't. However, if you purchased your bulbs from Lowes, sometimes you can return them directly to the store for recycling.